Jarhead No.1, Premium Metal Construction with Antirust Painting Tech, Hefty Feel in Handling and Built to Last. Push-Button Spring Release Mechanism, There is No Rattle After You Close the Blades. Nice Weight Sized and Surgical Self Sharpening Blades, Cut up to 54 Ring Gauge Cigars. Makes Your Enjoyment Anywhere and Anytime Possible. Built-in Double Blades Design Ensures the Best Flavor and Aroma, Less Waste and Better Burn for Each Taste with Equal Pressure on Each Side in One Quick Motion. Delivered in a Handsome Gift Box, A Perfect Gift for the Upcoming Holidays for the Cigar Enthusiasts in Your Life, or Simply Purchase One for Yourself. 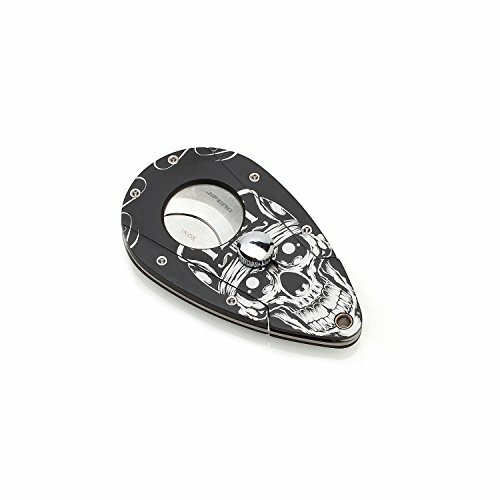 Lifetime Warranty, Order with Confidence, Love Our Cigar Cutter or Your Money-Back Guarantee within 30 Days, No Questions Asked. If you have any questions about this product by JIFENG, contact us by completing and submitting the form below. If you are looking for a specif part number, please include it with your message.